Reserve our New Book Now! For all you Hovercraft enthusiasts! Our new book is landing soon, and you have the chance to reserve your copy for a limited time only! It’s a brilliantly produced book, authored by our very own Jim Gray! Up till the release date on 14th May we will offer a £5 discount, leaving only £9.99 to pay. If you are interested please take a look at www.hovercraft-museum.org/reserve-the-hovercraft-book to secure your copy. Copies are flying off the shelves so don’t miss the chance to secure yours! 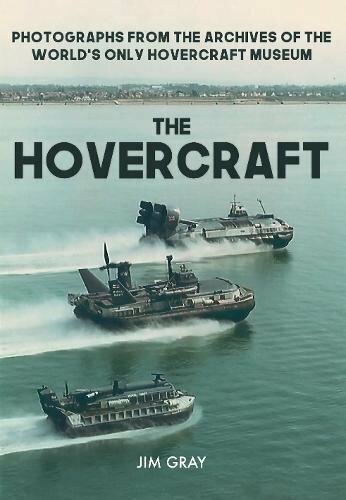 Lee-on-the-Solent is synonymous with planes and seaplanes, but it is also the home of another, slightly more unusual form of transport – the hovercraft. After the first cross-channel crossing by a hovercraft in 1959, there was a revolution in design and development. Within a decade, the mighty SRN4, capable of carrying 400 passengers and sixty cars across the English Channel in less than forty minutes, had arrived. As the commercial hovercraft thrived, the military also continued to innovate; the British Interservice Hovercraft (Trials) Unit (IHTU) being established in 1961. Utilising the archive of the world’s only hovercraft museum, based in Lee-on-the-Solent and boasting more than seventy historic craft, Jim Gray uses a wealth of rare images – many unpublished – to explore the importance and impact of the hovercraft, offering a fascinating glimpse into a vehicle that has captivated the imagination of the public for more than fifty years. As the newly appointed Project Manager for the SR.N 4 Princess Anne, I would like to provide you all with the first of many updates on the various restoration activities. After a short period of adjustment at the Museum over the winter (which included new trustees, volunteers and associated handovers) we can now start in earnest, our plans for the restoration of our largest exhibit, The Princess Anne. As we move into springtime, the opportunity to begin our long list of works must be grabbed with both hands! Several activities have been highlighted as priorities with many less pressing jobs also identified. At the top of the list is the need to make the rather fragile roof watertight and safe to walk on, which is no small feat given the large square metre area! A number of options have been considered for this, none of them cheap or quick to implement, so in the short term, individual repairs will continue to be carried out by our small engineering team. Equally important is the impending transfer of the Propellers from her sister craft The Princess Margaret. All of the preparative work has been completed and this week, we are in the final stages of ensuring that the health and safety and permissions aspects of the operation are all satisfied. All being well, the work will commence in the early morning of Saturday 18th March, with a small focussed team of personnel. The removal of props from Margaret is expected to be completed this weekend, but the whole swap process could take up to 2 weeks depending on the weather and other factors, so we ask that during this time, all volunteers/ visitors please observe the health and safety requirements that will be in place on site i.e Hi Viz jackets, Barriers, signage and instructions. Also, a priority is the re-painting of the craft in the Seaspeed livery. The Paint and associated equipment is currently being sourced in preparation of the proposed work party that will make a start on this on the 23rd March. All of this, of course, requires funding on a scale that matches the size of the craft, so look out for some funding incentives in the near future and please- spread the word! In the meantime, if you haven’t already, please take a look at our SRN4 GoFundMe page at https://uk.gofundme.com/srn4hovercraft. 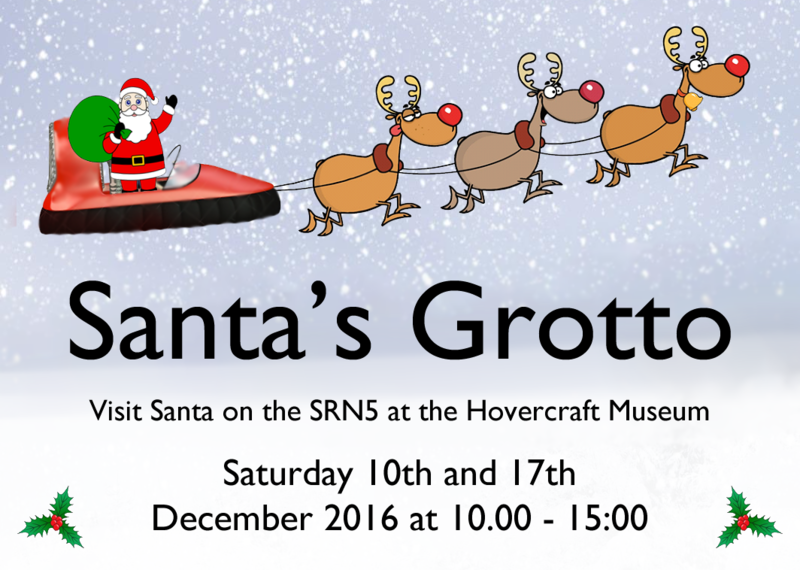 Santa is visiting The Hovercraft Museum this year. Come down on Saturday 10th and 17th to meet him on our SRN5 hovercraft. The whole museum will be open as usual and all visitors are welcome whether they wish to see Santa or not! The museum will be open both days from 10am till 3pm. There is no extra cost to enter the museum this Xmas (see here for entry prices & directions), but an extra £3 is required if you wish to see Santa and receive a present. We hope to see you there with your Santa hats! Work has begun to remove hazardous waste, old oils and kerosene from both craft. Contractors working for HCA began the work yesterday, with technical support from Hovercraft Museum staff. This is an important step towards us being able to secure one of the craft for the nation at the Museum although we can’t be more specific than this at the moment – stand by for further updates soon! UPDATE: Approx 4000L of 16year-old kerosene, contaminated with stagnant water, was successfully removed from the craft. We recently launched a campaign and petition to save the Princess Anne SRN4. In February the petition signatures had reached a fantastic 21,000 and counting. Help us to save one of the last two giant SRN4 craft on our site for the nation!